Accountable Care Organizations, or ACOs, are formed by groups of doctors and other healthcare providers. ACOs aim to encourage providers to decrease patients’ health expenses by taking responsibility for the quality of care provided. By doing so, providers receive a share of the Medicare savings while encouraging better preventive health care for their patients. The question for medical organizations that share on health savings is how can they improve patient care while decreasing care costs? This article focuses on the benefits of nurse triage and the different options for setting up a nurse triage program in a medical practice. Most medical interactions begin with a phone call by the patient. Triage nurses provide the crucial role in ensuring patients receive the most appropriate care for their symptoms. Having a good triage process helps save on healthcare costs by cutting down on unnecessary ER and doctor office visits. Having appropriate protocols such as Schmitt-Thompson protocols for the nurses to follow and document also ensures that nurses don’t miss symptoms that indicate a potentially serious condition. While the word “nurse triage” is often generalized for all systems that include a nurse triaging a patient over the phone, there are various options and factors to consider for setting up a system for a practice. It is important to differentiate the needs between day and night calls, as well as consider the costs and benefits of hiring your own nurses to triage patients versus outsourcing to a service. Day vs. Night (After-hours) Calls: During the daytime, when offices are open, nurses can instruct patients to come in if necessary. However, during nighttime, triage nurses have to decide whether the medical symptom is serious enough to escalate to an emergency visit or whether the patient can wait to be seen by the doctor when the office opens. As a result, there are different triage protocols for daytime versus nighttime calls (view sample protocols). Daytime protocols are shorter and overall simpler. The cost of a triage software for daytime use is relatively low and can be easily be incorporated into the daily tasks of an office nurse. The results from the triage can also be documented into the patient EMR portal helping the practice decrease liability from patient care. Options for Night Time Triage: Triaging patients when the doctor office is closed requires investment in a more complex set of protocols as well as a more extensive call center software. First, the triage protocols are more complex because the doctor office is closed and nurses do not have the option to ask the patient to come in for a checkup with the doctor. Second, because of the higher liability associated with these calls, there are also several features that need to be incorporated in the triage software such as call recording, and information about the on-call doctor. 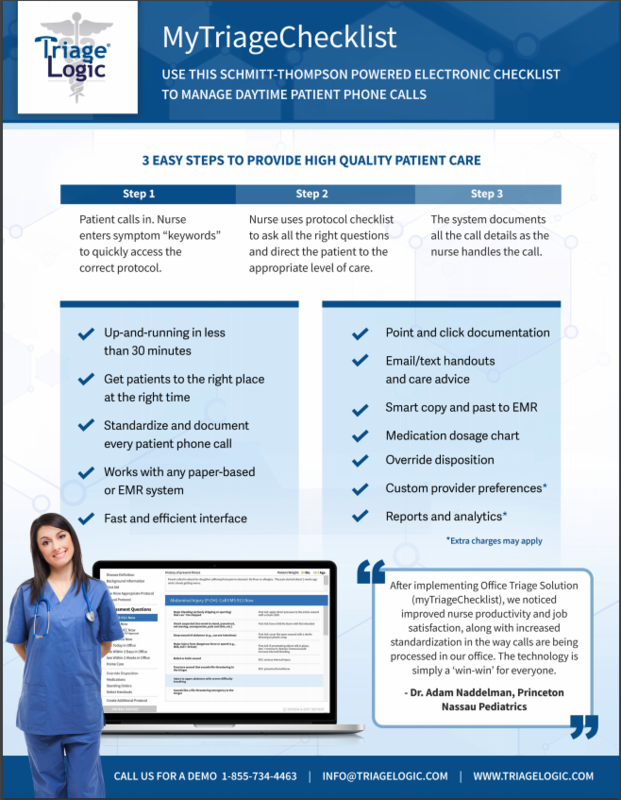 See our blog about transforming existing patient management systems and HER to clinical triage call center platforms.1. Hire clinical and non-clinical staff to answer patient calls. Organization Likely to Succeed: There are significant fixed costs with implementing an in-house call center. A larger organization with high call volumes, of at least 35,000 calls tend to be good candidates for their own system. Pros: Flexibility to perform multiple tasks (physician referrals, scheduling, disease management, class registration, or surveys). Cons: High initial investment, labor intensive for the nursing department, requires HR and IT involvement, and long-term investment with a slow ROI. Requirements to Start: In this option, the organization outsources the nurse triage function to an outside vendor, thus bypassing the need to hire its own staff and invest in a software. The vendor usually provides access to a call center infrastructure for the nurses to take calls. Many vendors also give customizable options to their clients such as the ability for doctors to have their own custom orders after the patient is triaged. Organization Likely to Succeed: Small to medium-sized practices. Pros: There is a low upfront start-up cost. There is no training for nursing staff or no HR and IT involvement. Organizations also get an immediate ROI response. In addition, experienced vendors result in a better level of care for patients. Cons: Less control over nurses and some of the triage nurse notes cannot integrate with EMR. Requirements to Start: The organization can use their own nurses and triage software during the day hours. During low call volume, the organization can outsource to a nurse triage center. A combined option has the potential to improve services and decrease costs. Overall, as your practice considers, their triage nurse options, look for nurses that triage patients with care and compassion. This helps improve the efficiency of the system where patients trust the nurses and receive the appropriate care to feel better and stay healthy. Patients are also more likely to follow the nurse instructions if they feel cared for and heard. Want to discuss your options? With 11 years of experience, the TriageLogic team can assist with deciding which program will be best suited for your company. Whether you are looking for a software infrastructure for your call center, outsourcing calls at any times, or a combination of both, contact us today for a free consultation.